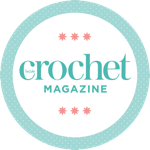 This month’s issue has a heavy emphasis on joyful, quirky projects for children and for those of us who simply don’t wish to grow up! We have toys, fun clothing and accessories plus blankets galore. I love Irene Strange’s whimsical twist on a practical and multifunctional item with her foxy neck cushion on page 50. It is both a toy and a pillow that is brilliant for travelling, ensuring children – young or old – are entertained as well as being comfortable. This sweet project can also double up as a fabulous retro draught excluder and looks wonderful in a kid’s room. If you are after something a little less childish yet no less fun, take a look at the gorgeous garments and accessories inside our pages this month. From pretty, fluffy cardigans and striking tops for layering to unusual and imaginative accessories, there is something for all tastes. Simone Francis’s cabled cowl has the seemingly eccentric addition of a bold contrast zip. This detail allows the scarf to be worn in a myriad of different ways, creating a beautiful and modern piece that is at the same time really versatile. Finally, we have a focus on incorporating granny motifs in some of our homeware projects, so we have provided you with instructions for professionally finishing granny square pieces on page 84. Many of the techniques in this section are applicable to most motifs, so it will also prove a handy guide for piecing together your lovingly made blanket or modular project. Enjoy exploring your childish side!